Eta Carinae is a massive, bright stellar binary system. The more massive component is one of the largest and most luminous stars known. In the central region of the binary, the powerful stellar winds from both stars collide at speeds up to 10 million km per hour. 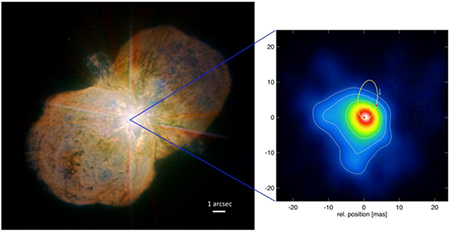 An international research team led by Gerd Weigelt from the Max Planck Institute for Radio Astronomy (MPIfR) in Bonn, and Professor Anthony Moffat from Université de Montréal and the Centre de recherche en astrophysique du Québec (CRAQ), has for the first time studied Eta Carinae using near-infrared interferometric imaging techniques. The team obtained unique images of the wind collision regions between the two stars. These discoveries improve our understanding of this enigmatic stellar monster. The observations were carried out with the Very Large Telescope Interferometer (VLTI) of the European Southern Observatory (ESO). Fig. 1: Left: Eta Carinae’s Homunculus nebula. Right: High resolution image of the wind collision zone in the central region of Eta Carinae. This region is about 100 times larger than the diameter of each of the two stars. The yellow ellipse is the binary orbit. The two red dots indicate the positions of the two stars at the time of observation. Credit: ESO (left) and Gerd Weigelt (right). The more massive of the two stars in the Eta Carinae system, called the primary star, is a monster because it is about 100 times more massive and five million times more luminous than our sun. In late phases of the evolution, such massive stars lose huge amounts of gas before they explode as a supernova. Studies of this dramatic mass-loss process are important to improve our understanding of stellar evolution. Both stars of the Eta Carinae binary system are so bright that the powerful radiation they produce drives matter from their surfaces in the form of massive, fast stellar winds. These high-velocity stellar winds violently collide in the space between the two stars. Extreme physical processes occur in this innermost region, where the very fast stellar wind from the less massive but hotter companion star crashes into the dense primary star wind with a velocity of about 3000 km per second (more than 10 million km per hour). In this collision region, temperatures reach many tens of millions of degrees, hot enough to emit X-rays. In the past, it was not possible to resolve this violent collision zone, because its extension is too small even for the largest telescopes. For the first time, an international team of astronomers led by Gerd Weigelt from the Bonner Max Planck Institute for Radio Astronomy has obtained extremely sharp images of Eta Carinae (see Fig. 1) by using a new imaging technique based on long-baseline interferometry. This technique combines the light from three or more telescopes to obtain multi-telescope images called interferograms. From a large number of interferograms, extremely sharp images can be reconstructed using sophisticated image reconstruction techniques. This interferometric imaging method can achieve a resolution that is proportional to the distance between the individual telescopes. 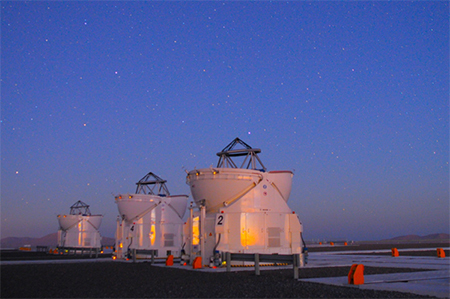 The new Eta Carinae observations were carried out with the AMBER interferometry instrument of ESO’s Very Large Telescope Interferometer (VLTI; Fig. 2). The team combined the infrared light from three of the movable VLTI telescopes with 1.8-metre mirror diameter. Because the largest distance between the telescopes was about 130 metres, an angular resolution was obtained that is about 10 times higher than the resolution of the largest single telescope. “Our dreams came true, because we can now get extremely sharp images in the infrared regime. The ESO VLTI provides us with a unique opportunity to improve our physical understanding of Eta Carinae and many other key objects”, says Gerd Weigelt. The applied high-resolution imaging technique allowed the team to obtain, for the first time, both direct images of the stellar wind zone surrounding the primary star and the collision zone in the central region between the two stars (Fig. 1). Because this technique provides both high spatial and spectral resolution, it was possible to reconstruct images at more than 100 different wavelengths distributed across the Brackett Gamma emission line of hydrogen. This is of great importance for astrophysical studies of Eta Carinae, because these multi-wavelength images show both the intensity and the velocity distribution of the collision region. Velocities can be derived from the multi-wavelength images because of the Doppler effect. These results are important to improve physical models of the wind collision zone and to better understand how these extremely massive stars lose mass as they evolve. The wind collision models used to interpret the new observations were developed by Tom Madura (San Jose State University) and collaborators. Tom Madura explains “The new VLTI observations will play an important role in future model calculation because we have now higher resolution information than ever before to constrain the models”. The research team comprises G. Weigelt, K.-H. Hofmann, D. Schertl, N. Clementel, M.F. Corcoran, A. Damineli, W.-J. de Wit, R. Grellmann, J. Groh, S. Guieu, T. Gull, M. Heininger, D.J. Hillier, C.A. Hummel, S. Kraus, T. Madura, A. Mehner, A. Mérand, F. Millour, A.F.J. Moffat, K. Ohnaka, F. Patru, R.G. Petrov, S. Rengaswamy, N.D. Richardson, T. Rivinius, M. Schöller, M. Teodoro, and M. Wittkowski, participating from MPIfR are Gerd Weigelt, the first author, Karl-Heinz Hofmann, Dieter Schertl and Matthias Heininger.